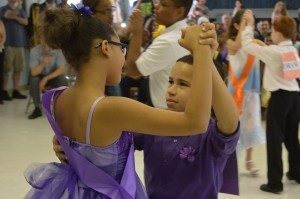 During the 2017-2018 school year, Dancing Classrooms Philly served 3,341 students in 126 classrooms, making us the second largest Dancing Classrooms affiliate in the world. DCP strives to enrich the lives of as many children as possible throughout the school year and your school could be next! A Dancing Classrooms Philly residency is currently available for fifth and eighth grade students. All fifth and eighth grade classes in your school must enroll, all children are required to participate and classroom teacher involvement is strongly encouraged. The 45-minute lessons run twice weekly for ten weeks and finish with a culminating event for family, friends and community. DCP needs a clean, well-lit space, preferably without carpet or foot traffic. A boom box with sufficiently loud speakers is also required. An invitation to participate in our Colors of the Rainbow Team Match is extended to all participating schools. The full cost of the program is $2,800 per class. Many schools hold fundraising events or apply for grants to offset the cost. DCP makes every effort to assist schools in finding funding for the program. To request an application and enroll your school, please contact us at info@dancingclassroomsphilly.org or call the Managing Director, Kate Lombardi, at 215-268-3973.